Interruption Based Selling does not work any more – period! Traditional cold calling is still the default approach of too many business people – call centers around the world are filled with rows of salespeople pitching cold. It doesn’t work but too many businesses can’t think of a better approach. A paradigm shift in sales strategy is needed if businesses are to promote, grow and thrive but what is to replace the cold call too many businesses depend on? The business world has changed dramatically and permanently. We have moved away from a push model where we were told what to buy to a pull model where the customer sets the agenda. In the past, companies owned factories and sold products and we bought what was on offer. Today, companies own brands instead of factories and the value of every brand are in the hands of the consumer. Marketing has changed from a world where the consumer was manipulated to a world where the buyer must be inspired. Think Apple and you will understand that the sales process has changed radically! The rewards are huge to brands and businesses that can truly inspire customers to buy! The result has been the death of newspapers and network television and the growth of new media like Craigslist, LinkedIn, Facebook, Twitter and an ever-changing landscape of consumer driven media. Money doesn’t guarantee success anymore, money chases success. Facebook was worth billions before it made a dime of profit and just days after its initial public offering, valued at one hundred billion dollars, it is facing an uncertain financial future in the face of mobile, which challenges its very revenue model. In a business environment full of change, traditional push sales models are failing and the push back from consumers and business is increasing. British Gas voluntarily ceased door-to-door selling last year and nobody in sales refers to themselves, as a salesperson anymore – sales, is a very dirty word. What is needed is a Paradigm Shift from a push mentality to a connection mentality. The shift moves from pushing the buyer to compelling the buyer. The shift moves from shouting our message to a conversation about desires and needs. 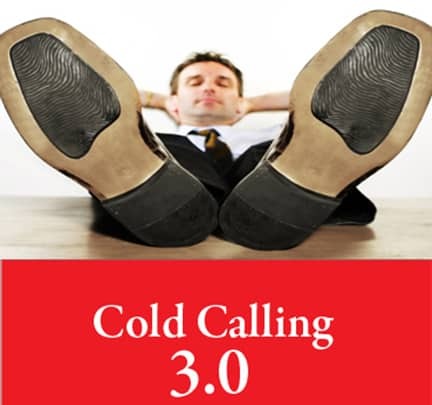 In this paradigm shift cold calling become redefined and refined and Cold Calling 3.0 © is the result! In the old paradigm cold calling is the marketing process of approaching prospective customers or clients, typically via telephone, which were not expecting such an interaction. The word “cold” is used because the person receiving the call is not expecting a call or has not specifically asked to be contacted by a sales person. In the new paradigm cold calling evolves from interruption to a process of engagement where a cloud of compelling messages and permission-based marketing allow the prospect to participate. We move from a cold call to engagement. We use a variety of social media and marketing, driven by compelling messages, to warm the path so that once we begin to connect we can quickly engage and convert. We filter our leads so that when we do connect with our prospects we are able to offer a compelling message that inspires the buyer. It doesn’t matter what the industry, if we have something of value to offer we can create a compelling message. This is the new paradigm! What does this mean for the sales process? Salespeople and sales organizations need to get much, much smarter. I predict that sales teams and marketing teams will merge and the titles ‘salesperson’ or ‘business development manager’ with be dropped in favour of ‘community managers’ and ‘engagement specialists’ to reflect a more connected process. Instead of playing the increasing difficult cold calling ‘numbers game’ it is time to start using a much broader range of tools to intelligently warm the prospect and get permission to engage. The change for the elite salesperson will be smaller, as they have already evolved considerably but average salespeople will find that they build much more stability into the sales pipeline and that average earnings increase regularly as they develop into using a system that builds more engagement. Companies that take on the system will literally transform the organization! The very best salespeople have always been connecting this way but for most businesses the change will be large. Most sales organizations have already seen that the cold call approach that has been working for years is less and less effective. The walls put up by buyers are getting higher and higher and shouting louder just doesn’t work any more. Businesses need to know whom they want to sell to and why. What is in it for customer? What compelling messages will inspire the sale and how can the buyer be reached and engaged without trampling on personal space? Selling will always drive business but Cold Calling needs to evolve! The problem is not Cold Calling in itself but that the traditional Cold Calling approach just doesn’t work any more. A shift in perception and approach can change everything. This is about selling smarter, not harder, but also addresses the biggest symptom of bad cold calling – avoidance of the connection process! Nothing happens in business until something is sold and nothing happens in selling until a sale is closed. The problem for most salespeople and business owners, who must sell to grow their business, is with even starting. Salespeople are people first and procrastination, fear, and uncertainly are among the issues that every salesperson struggles through every week. It is the limits that we place on ourselves that will hold us back more than any external factor. People like to talk about the economy, changes in media, voicemail and a myriad of reasons why success in sales does not happen. These are simply excuses. Not to say that for a high performing salesperson that these factors don’t have a very real impact on the volume of business – they do! However, for the vast majority of salespeople the only thing holding back the sales performance is human performance. Many of us struggle with confidence and action. When I was approaching forty, a few years back, a friend of mine committed suicide. It was a sad story – a bad divorce, financial struggles, heavy drinking and finally a complete loss of direction. Rory hung himself in the basement apartment he had rented. It was a sad story, made sadder by the fact that he had five children. We always get more of what we think about in life and he had become absorbed with the pain of his life until he could see nothing else and the pain became unbearable. Rory’s story was a sad one but the lesson I took away from it is that life is a gift. We all face struggles and we all must face the consequences of our actions and decisions. Ultimately we decide if our own life will be focused on growth and success or pain and failure. This basic decision – deciding whether we are going to be ‘life half full or half empty’ kind of people – will set the tone for all of our actions and results. We do get more of what we focus on in life! This is very real! If we focus on love and abundance then that is what we will bring into our lives. If we focus on fear and lack then we will attract that to our lives. This is the starting point to a successful sales territory or business – deciding first that success and abundance will be our focus! This decision alone will make all the difference, as this attitude will frame the perspective from which you view every challenge and every opportunity. Look for and expect success and abundance and you will find the opportunities that other miss and get the positive outcome others can’t find. This book will discuss skills and approaches that can help you sell more and grow your business but the biggest difference that you can make in your life and in your sales success is both the easiest and hardest thing you will ever do! I consider myself to be healthy, fit and active. I have, as I have grown older, learned the value and importance that fitness and health play on success and attitude. I love to be active and running is my favorite thing in the world. I have run a handful of marathons and triathlons and simply love feeling strong, fit and alive! I have not always been fit and have on a couple of occasions put on quite a bit of weight. Usually, for me, weight gain came with getting lost in enjoying life instead of investing in life. I get off track and almost before I know it I have put on twenty or thirty pounds – maybe you have the same problem. Inevitably, I wake up one-day look in the mirror and decide I am fat and have had enough. I get mad and make the decision to lose the weight. Until I reach this moment I am only playing at the idea of loosing weight, grumbling at the mirror and buying low fat cake! Once I do get mad and decide that I have had enough then the weight simply falls off – I have lost as much as twenty-five pounds in a month by eating right and exercising like a fool. I am pleased to say I have only had to do this twice in my life but change, even huge change, can be easy if you have the will. The trick to loosing weight or any goal in life – no matter how difficult – is not technique but attitude. The hardest part is not the doing but rather in the decision to do. Once we decide, truly decide, then every power in the universe comes to our aid and success becomes a fact! If we have not come to that decision then we will struggle – whether it is weight loss or selling! This book is about the tools and the attitude that will help you succeed in selling but the biggest difference in your success will be the simple decision to succeed. Just to be clear, I don’t mean wanting success like you want a pizza. I mean wanting success like you want air to breathe! Take Away: Decide that success will be part of your life and that you will accept nothing less no matter what it takes or what challenges you face and your focus will subtly shift from failure to success. Once this is done then success is assured and the tools in this book will become real aids to your success! Decide you want success, really want success!